It’s great either as a dessert or a sorbet course. 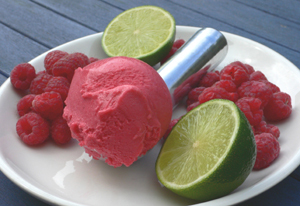 If it’s for a sorbet course, you might want to add another lime to make it more tart. The chocolate sauce recipe I gave here would be a great addition if it’s a dessert. 2. Put the sugar and lime zest in a heat-proof or pan. 3. Boil water in a tea boiler and measure out one cup. 4. Pour it over the sugar and zest, stir until the sugar has dissolved, and let it sit for about half an hour. 5. Strain out the lime zest and discard, and put the sugar syrup in a pan. 6. Add the raspberries and bring to a boil. Turn off the heat. 7. Stir it vigorously to break up the raspberries, then place into the refrigerator until cool. 8. When it’s fully cool, add the juice of the limes. If you don’t have a juicer, put a sieve over the bowl to catch the pips, and squeeze away. 9. Freeze using a domestic ice cream maker, or cover and place in the freezer. 10. If you use the latter method, wait until the sorbet is about halfway frozen, mix it vigorously, then return to the freezer. 1. It’s hard to make sorbet without an ice cream machine. You will need to interrupt the freezing process and stir, or you will be left with a block of red ice! The more times you do this, the better the consistency will be. 2. For more information, I wrote about working with fruit in ice cream here. 3. 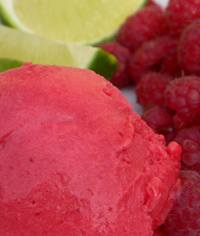 This sorbet is suitable for coeliacs, the lactose-intolerant, and is virtually fat-free. For more on special diets, click here. I can’t wait to try this recipe this summer. The colour is gorgeous! Any suggestion of what alcohol & quantity would work in this sorbet? I think vodka would work – 100ml. I also tried it with Kirsch (Cherry brandy) and it came out fantastic! About 100ml as well.